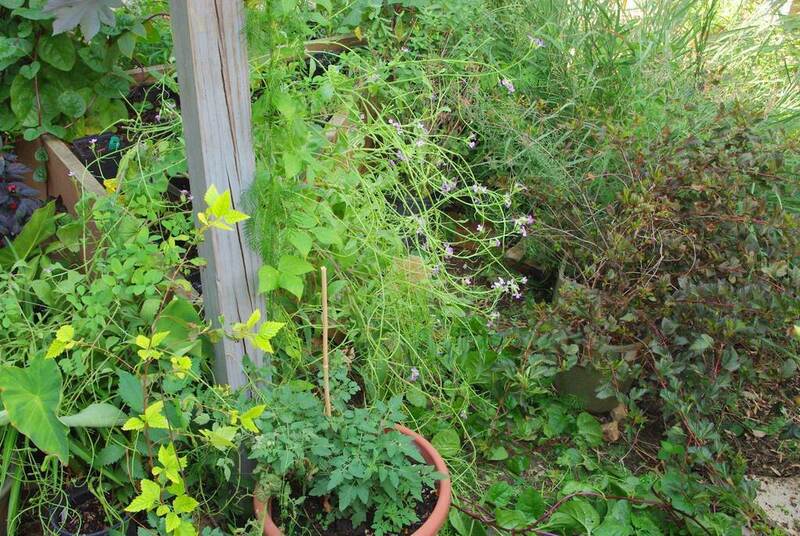 This is the time of year when my garden reminds me exactly where I had certain flowering vines planted last year, as the seedlings all wake up and almost overnight have smothered plants that don't appreciate the climbers. 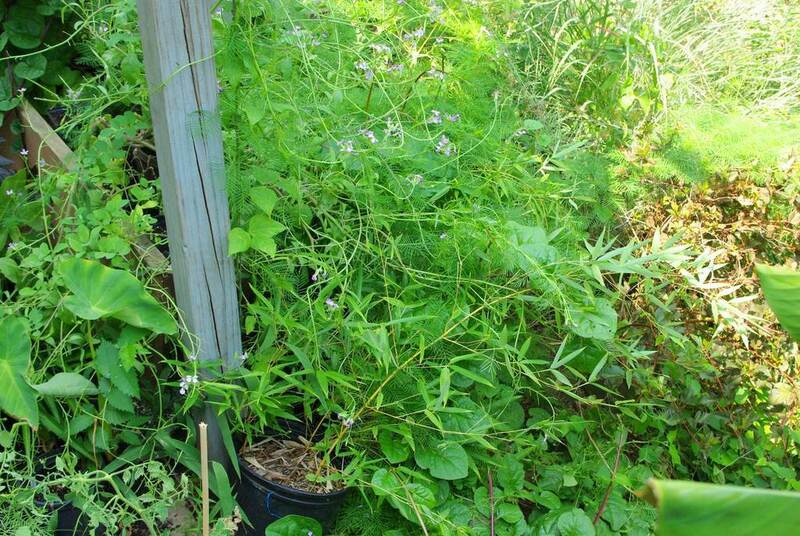 Cypress vine in particular, as it seems I've been pulling these things out for a few days now, and there's always more. Not sure why they're so late this year (are they late?) but it's probably to do with the lack of rain, but they're going strong now. Especially here next to my little triangle box, which already has a different climbing vine planted at each corner and doesn't need a dozen more cypress vines added to what soon will be a vertical jungle. I love the feathery foliage, but cypress vines have to go. Unfortunately it's not an easy task when left this long, as the vines are entwined everywhere! 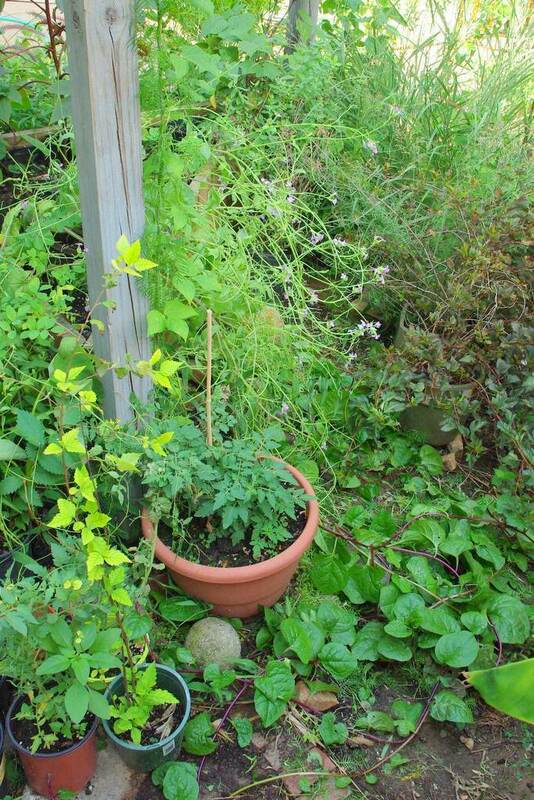 It doesn't help that I had six or so potted vines in this bed (which has been my "nursery" bed for seedlings this year) that were contributing to the tangle. I didn't want to damage those potted vines at all (they were used in my new trellis project) so I had to carefully de-wrap and unwind tendrils for quite a while. I did remove a couple of small potted bamboos from the area and moved a few smaller pots around, but the area looks so much cleaner and nicer now, doesn't it? 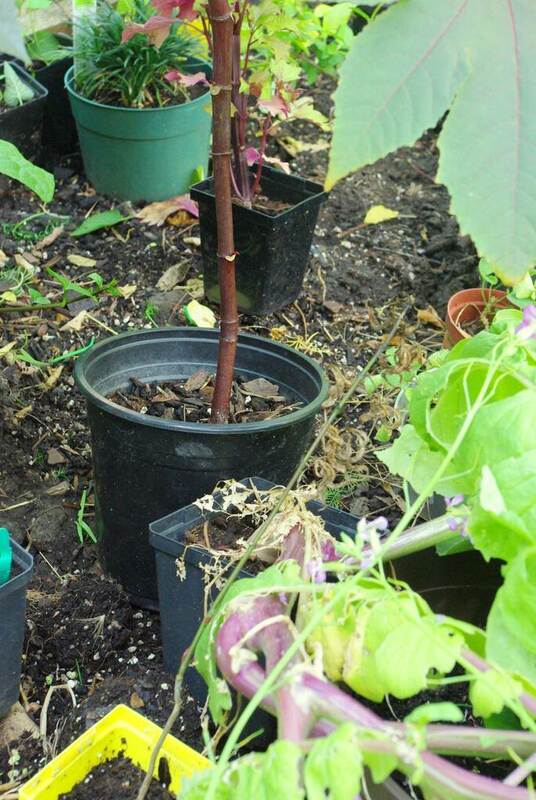 That's a Malabar spinach volunteer on the ground -- I'm letting it grow as a luscious groundcover because I love the thick, glossy leaves and purple stems. I've got so many of these in the garden this year -- six I believe. The pink flowers that are kind of hanging out of the box are a rat's tail radish -- I'll talk about that soon as it deserves a post of its own. At first I was just going to leave them in place, but then decided that I'd rather use this box for edible greens this fall, so they had to go. 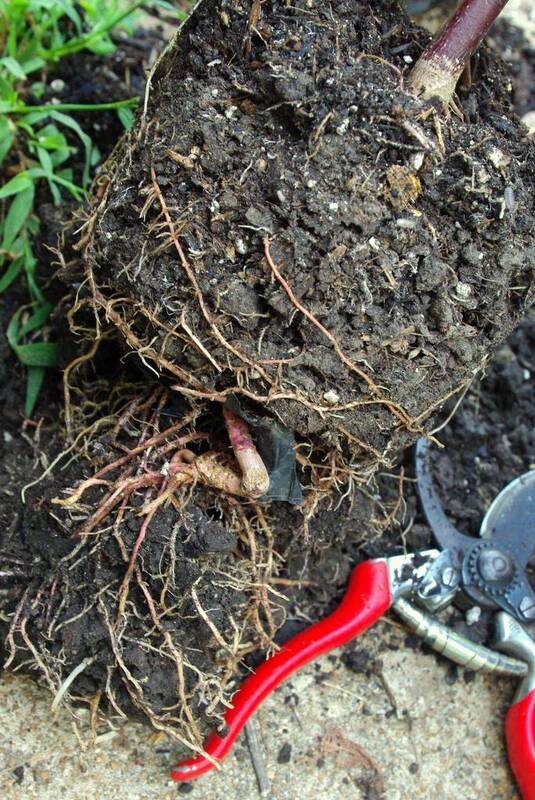 There are two ways to remove them: one is to grab the pots and pull, ripping lots of roots off. That's what I normally do. 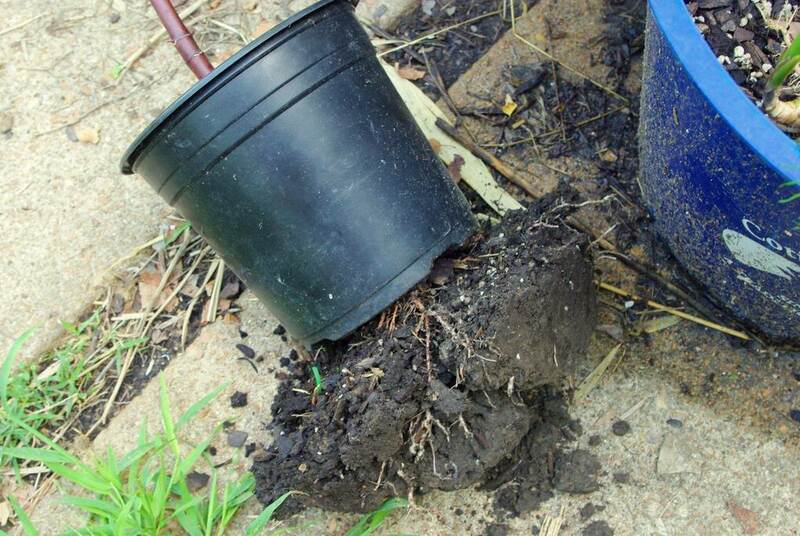 The second way is to dig up a rootball, then cut away the plastic pot. 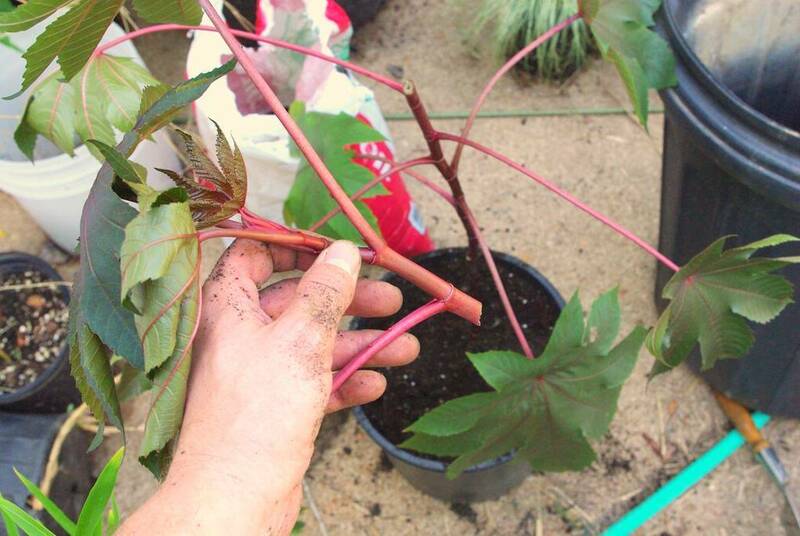 The plant has three main stems now, and is full and beautiful. Glad I didn't pull it out after the rabbit chomped it! So that's my clean-up task for today. 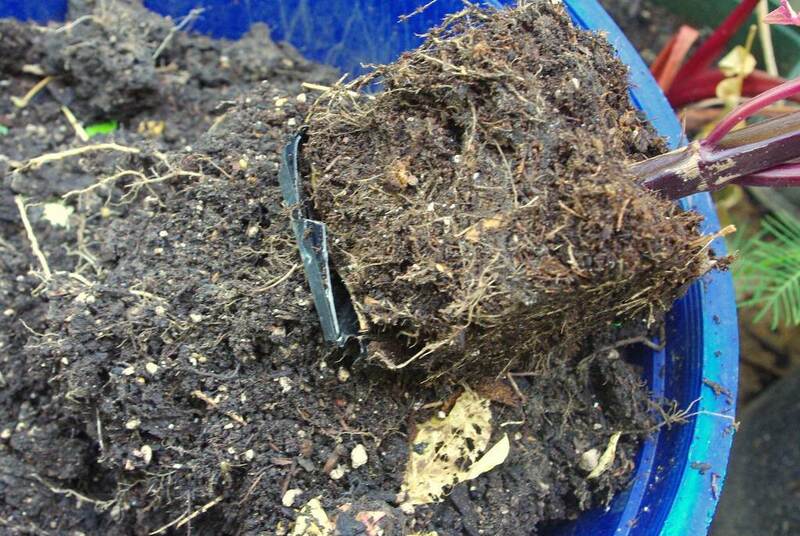 I love restoring order to out-of-control parts of the garden! 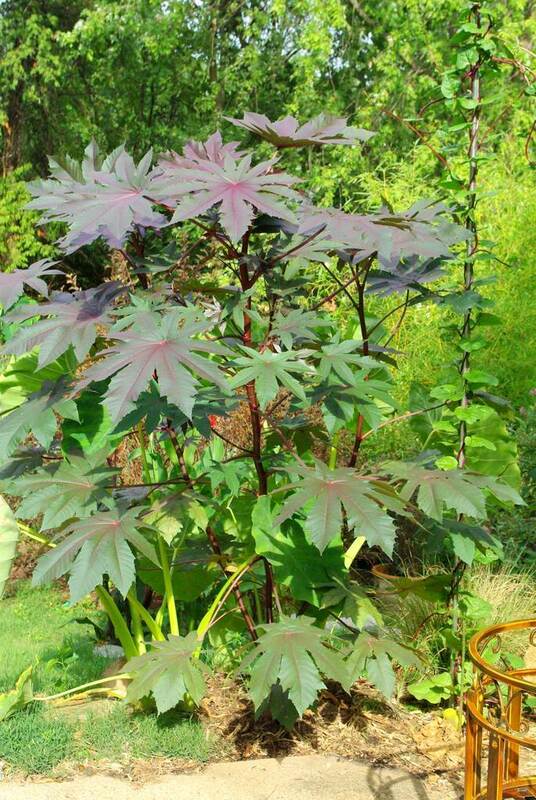 I think that photo of your rabbit-chomped Castor Bean has pushed me back into love with that plant. This year I shied away from them but I might just have to include a few next year! danger: it really depends on which variety you grow I think. I like the deep purple type which this was supposed to be, but I don't think it's the right purple cultivar. I've seen some specimens locally with no green in the leaves, and you can see my plant has greenish leaves. Of course you could also grow green-leaved varieties, but I think you gardeners in the PNW have plenty of plant choices for large green leaves already. 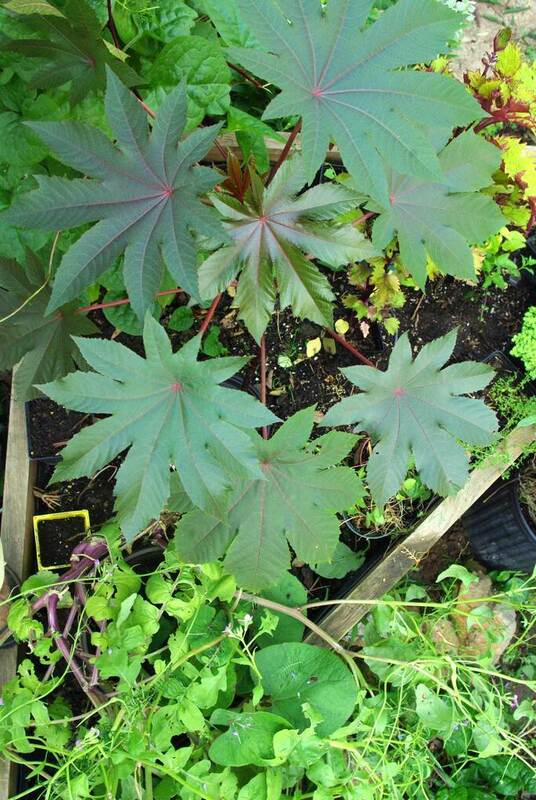 Don't castor bean plants need hot weather to really take off? Maybe not.